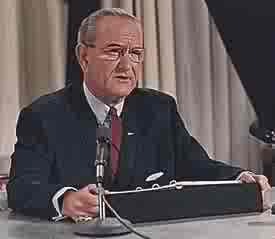 6:43 PM Forty years ago today, Lyndon Johnson announced that he wasn't going to run again for president. I well remember that day. NPR reports this evening how that event spurred a peace movement. The quote from the one-and-only Eric Sevareid in this report says it all. 5:29 PM The rain is now coming down in bucket loads. I'm sitting here at my computer typing away. A special blessing just now was watching Duck and Mary land on our pond. Nice serendipity on a dismal day. Well, Nate just phoned. He needs some help moving furniture in his house to get his home ready for his bride. My mind goes to John 14:2 ("I go to prepare a place for you"). Nate's already being a good husband. Off to Jessie's house! 3:39 PM When you keep anxiously waiting to see what others are writing about you, when you have hidden desires to be some important person in the community, when you have fantasies about prominent people mentioning your name, when you keep hoping for more stimulating work, then you know that you haven't even started to allow God into your heart. When nobody writes about you or hardly even thinks about you, when you become just another Christian "brother," when you have been forgotten by people and feel estranged even from your own loved ones, maybe then your heart can become empty enough to give God a real chance to let His presence and love be known to you. Then the Lord will truly be at the center of all things. 3:29 PM A "retired" pastor in our area does a lot of pulpit supply, and I have grown to know and love him in the past 6 years since we moved into Bradford Hall. His name is, in fact, on my pastor prayer list. I saw him just last night at the singspiration. He recently told me how old he was. I couldn't believe it. I had never realized he was that elderly. His great energy and zeal, his matchless speaking ability, his kind and gentle spirit fill me with a growing admiration for him. To be a "rolling stone" at his age is really quite an accomplishment. I hope that when I get to be his age I will have a mere fraction of the vibrancy that he has. Above all, I enjoy his constant smile and sense of humor. I think that only makes me like him all the more. 2:56 PM I have a very important anthropological announcement to make, to wit, the brick-ozoic age has now come to a glorious end. That's right, we finished the chimney, from the ground floor all the way up through the attic. I think we'll need to find some way to celebrate this auspicious event. Hey, how about a wedding on Saturday? Meanwhile I am working feverishly preparing for my courses this week: a major review of the participle and infinitive in Greek, and the topic of church life in our New Testament class (this week we're in 1 Timothy, whose theme is "that you may know how to conduct yourself in the household of God, which is the church of the living God, the pillar and support of the truth," 1 Tim. 3:15). As always I find myself having to make sweeping generalizations, whether I am talking about the Greek language or about the exegesis of specific texts bearing upon ecclesiology. I am not surprised that some should disagree with me about these generalizations; indeed, I disagree with most of them myself, but they must be made, even if they're glaringly untrue (in one sense), because one has to simplify things in any beginning course. So far as all the more important and fundamental facets of Greek and theology are concerned, however, it's impossible to explain anything to anybody really. One must simply learn things for oneself for any true and lasting learning to take place. In this regard, I want to announce that in our New Testament class this Wednesday we will have a very special guest lecturer, Alan Knox, who will be sharing with the class his views on the church and especially how his thinking has changed and developed over the past few years. Alan is one of my Ph.D. students in New Testament here at SEBTS and is also the editor of The Assembling of the Church website over at blogspot. He will speak from 1:30 to 2:30 and then field questions from the audience. If you are not a student at the seminary but would like to hear what Alan has to say, I want to invite you to attend our session as my personal guest. Just send me an email and we'll go from there. By the way, Alan is also an elder at Messiah Baptist Church, whose website is well worth perusing. I also had the delight of interviewing brother Alan here. It should be altogether a most interesting and stimulating class. 9:55 AM The latest addition to our home page is called Where Are the Peace-Makers? 9:46 AM Today we are living in a cloud. I piously hope it will be warm and sunny again soon. We are heading out shortly to finish the chimney, Lord willing, provided our legs hold out, especially Nathan's knees (the poor man can't even stand up straight in the attic to his own home). I will do my best to keep him well supplied with bricks and mortar. It is the mules who get things done in the world I suppose. O, yesterday the bridal shower for Jessie was a smashing success I am told. Old Natie boy has found hisself a real winner, and that's fur shure. 9:41 AM My word, but Chuck Baldwin is at his best in this essay on the GOP. I am old-fashioned and only really at home with the most unmagical kind of direct discourse. I even enjoy Chuck's brevity -- "less is more" becoming less a rarified epithet and more of a reality in my own speaking and writing. Biblical, rock solid, and to the point -- that's Chuck Baldwin in a nutshell. 9:34 AM I have a huge problem, but it's a good problem. My prayer list has gotten so long and unwieldy that I have gone to a new schedule. Beginning today I have a different prayer list for each day of the week: Monday for family members (local and extended), Tuesday for my seminary family (including my 160 or so students), Wednesday for pastors and other church workers, Thursday for missions (Ethiopia, etc. ), Friday for my local church, community, and friends, and Saturday for the salvation of the lost (my "salvation prayer list"). Sundays is potpourri, you might say. I will, of course, pray for family matters and for those who need salvation every day, not only on Mondays and Saturdays. And each week the lists will get longer I'm sure. In the epilogue to the book A Thousand Shall Fall (see below), I learned that Franz Hasel died in Germany at the age of 92, having befriended many young people in his long teaching and preaching career. At his funeral, one of those students summarized the loss they felt by asking, "Who will pray for us now?" This gives me much encouragement to be constantly devoted to praying for others, my students especially. God may work quite unexpectedly as a result. 9:19 PM Just back from our 4-church singspiration, the best one we've ever had -- at least since the last time we got together. A cross between country gospel, blue grass, and hokey. I certainly don't know nearly enough about music to be able to remark on the quality of our singing, but thanks to a judicious infusion of the Holy Spirit we truly had what is called a "sang" tonight. The service got over at 8:00, then the real singing began, with Nate and Patrick at the piano, or we simply jettisoned the accompaniment and sang Acapulco. I don't see any particular reason not to report it like it is -- a truly remarkable evening of music that leaves one breathless with thanks and praise to God. The perfect capstone to a wonderful day. 2:13 PM Speaking of Jonathan ("der Grosse"), he just sent us a photo of himself that can be put to very good use. Many have been asking us what the dress code for Saturday's event is -- formal, semi-formal, casual, nice-causal, Hawaiian, hill-billy, etc. Thankfully, Jonathan can say in one picture what a thousand words could never do. 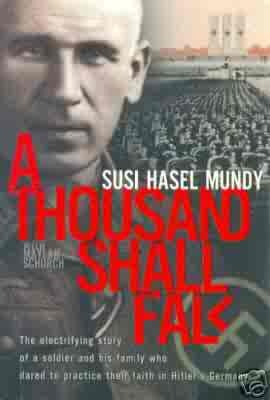 9:08 AM Jessie's brother Jonathan ("the magnificent") loaned me his copy of A Thousand Shall Fall, the story of a 40 year-old German pacifist who was drafted and assigned to Pioneer Company 699, Hitler's elite frontline unit. Having lived in Europe and been in several of the places named in the book, including Frankfurt am Main and Odessa, and having been interested myself in WW II history, I found this book magnificent and much more interesting than its title might indicate. If all Elizabethan tragedy is melodrama, then German non-fiction is sui generis. Franz Hasel refused to imbibe the pagan philosophies of his commanders and comrades-in-arms, and somehow survived to tell about it. Imagine -- a Sabbath-keeping, pork-refusing, conscientious-objecting Christian serving as a cog in Hitler's war machine as it crashed into Poland, Sedan, and Russia! The notion may be rather absurd, but the story is a good one and the ethics identical to Adventist theology -- and this is not even to mention the quite incredible comic statements emanating from the Vaterland: "We are the super race. We are invincible. Victory Salvation!" This touches the sublime. The decadent and putrefying nations of England and France quake. This vulgar beastliness, alas, did not disappear in the twentieth century. All countries eventually get the disease of decadence, even though individuals in them may see the light of day. As Socrates would say, "O dog!" (ne ton kuna). Note: One of Franz Hasel's sons, Gerhard, eventually became an internationally-renowned Old Testament professor at Andrews University in Berrien Springs, IN. He published 14 books and hundreds of journal articles before being tragically killed in an automobile accident in 1994. 6:36 PM A few days ago I worked in short sleeves. Today I wore a parka and a ski cap it was so cold. What a difference a week can make. "We're in the attic now, we're not behind the plow" -- halfway to the roof in fact. It's a good feeling. Nate and I had an extremely enjoyable time working together today, as we in fact always do. I'm not sure why that is. I think a big factor must be the indisputable fact that our personalities, temperaments, and styles are almost identical -- even if our skills and aptitudes are not. We have thus worked side by side for 7 years here on the farm -- two able, imaginative, energetic men with wide-angled intellectual lens capable of taking in the broad view of life. In this time we have never had a single disagreement, argument, or spat. We've prodded, backed off, nudged forward, given grace, aided and assisted each other as we tore down this, built up that, put up miles of fencing, baled hay, and mucked manure. Now the chimney goes forward quite nicely, and I am certain the final effect will be very pleasant, both from outside and in, once we punch through the roof. I was very glad I was able to work with Nathan on this project, as it represents a capstone of sorts to our life as a family. He will now have his own family, and a very capable, wise, and energetic wife to assist him with his doings and goings -- though I have the impression that yours truly will still be called upon from time to time to offer his very considerable expertise when great projects are underway. One thing is sure: life on this farm will never be drab or boring. O, the weather forecast is calling for a good bit of rain this week, extending possibly into the weekend. Quien sabe? If it rains on Saturday, it rains. I can hear Nathan saying now: "The Lord knew the hay fields needed it." And he'd be right. 8:55 AM My mentor in college once told me, "Don't be too critical of other people and love much" -- and I have come to see more and more how wise that advice was. It was a warning against a rather conceited and selfish fault of my own. I think this is what Paul meant when he used that rarest of Greek words in Phil. 4:5 that means "big-heartedness," "gentleness," or "forbearing spirit." I see this, I understand it -- but when is God going to break through all my defenses so that I can see not just with my mind but with my heart as well? It was true for my college professor. May it be true for me today! 8:34 AM In one week the long looked-for and long prayer-for day will be upon us. We will open up our home to perhaps several hundreds of friends and family members whose purpose will be to joyfully celebrate the marriage of Nathan and Jessica, who have looked to the Lord God for aid and direction. Becky and I can only stand and gaze in amazement at the goodness of the Lord. At every step we have seen the Lord's fatherly hand in this blessing. They are acting by the dictates of their conscience, and God is blessing them because of it. They believe that marriage is above all a spiritual covenant, and thus the three-hour dinner and celebration will focus upon the Lord God of Heaven from whom all blessings flow rather than upon the unworthy couple who wed that day. This is as Nate and Jessie desire it. They seek only that their wedding supper be proof of His faithful love. In this freedom I am able to say, "O Lord, bless the union of these Thy humble servants, whose one desire is to live wholly for Thee. Let Thy holy name be praised forever!" 6:10 PM Done! Well, almost. Weeding out the garden beds still awaits my labor, not to mention the great cover-up. My un-calloused hands are extremely averse to such work, hence the blisters that have now made their annual appearance after tilling. 6:03 PM Newsflash: China, which of course funds the U.S. debt, is more capitalistic than America. In China, they save and invest over 35 percent of their income. In America, we save and invest less than 2 percent of our income. When people come to work for you in China, they don't ask, "How many days holiday do I get?" they say, "How many days can I come to work?" They want to live like we do, and they're willing to work hard, invest, and do whatever they've got to do. The drive in China is the drive we in America had once. 12:44 PM Time seems to have been oiled this spring, like a thief, for the express purpose of slipping between our fingers. Only 8 days to go. Becky has gone a-shoppin' with our daughter Liz, while Nathan is down in Carolina delivering this order of 50 bales of hay. The latter is of course my favorite; there is a reason, after all, why we named our farm Rosewood. O, I want to say thank you to Lew Rockwell for linking today to our essay on "Bush's War." I do believe that shortly after 9/11 we had a golden opportunity to solve the problem of terrorism either through Machiavellian means or through cooperation and thus could have gotten rid of Bin Laden & Co. But instead we have devolved into the pitiful situation of the cancer patient who will die if left alone and will die if he undergoes the knife on the operating table. I see no reason to suppose that, when led into the temptations offered so invitingly by political power, any of the presidential candidates will not gleefully succumb to them, in precisely the same way that the current leadership in Washington is doing now. If one wants a demonstration of the basic misère de l’homme, one could hardly choose better than Clinton, Obama, or McCain. 8:45 AM During my 3 years as a doctoral student at the University of Basel I found my Doktor Vater to be at once utterly brilliant, approachable, rigorous, and caring. In many ways I have sought to emulate him in my own teaching. Professor Reicke had a passion for hard work, detail, and precision. He had an impatience with mental laziness, so-called "relevance," and bureaucratic ineptitude. Most impressive of all were his curiosity, simplicity, and personal piety. I offer these thoughts because I suppose it is only fair that my own doctoral students know what I expect of them. 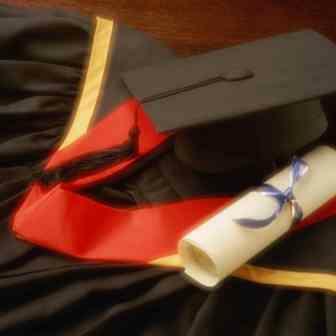 Doctoral work is the greatest academic challenge a student can face. It should also be the most joyful. 8:32 AM In about 9 weeks Becky and I will be returning to Ethiopia. It sounds like we lead a busy life, and we do, but I cannot imagine life in any other key. I do wonder sometimes whether America will be around when it's time to return home after one of our trips. The country simply doesn't understand that we are living beyond our income, and will have to pay for it sooner or later. I fear that the sun is setting in the West and that I must therefore try to be more of an asset than a liability to the kingdom in our remaining days. Please pray for us, more now than ever, as our travels will only get busier in the future and the responsibilities are truly great. 8:12 AM I just finished reading the entire book of 1 Timothy -- a task I have implicitly assigned to my New Testament students for Wednesday next and which I myself must therefore fulfill. Once again, reading a book of the Bible straight through enables one to appreciate the strength and nobility of the language. Style is always something you want to look at in the sense that splendid writing can make seemingly inconsequential notions seem valuable and important. Paul's first letter to Timothy is a very noble work; like Hebrews, it is a book that finds a form of expression that is esthetically comparable in quality to its subject matter. The odd thing is that every time I read the letter different topics jump out at me as salient. An example is Paul's exhortation to the "rich" (which today would mean any American when compared to the citizens of almost any other nation) to "do good, to be rich in good deeds, to be generous, and to be sharers" (6:18). All this is to be done in view of "storing up a treasure ... for the future" (6:19). The exhortation proceeds contrapuntally. The two themes run parallel, the after-death experience throwing light on what is going on now in the material world, the events of time taking on a new significance against the backdrop of eternity. This Weltanschauung -- this way of looking at our possessions as things we do not possess at all but merely objects we are to "steward" -- is a wonderful theme in Scripture and one to which I often return in thinking about the way I choose to invest my time, energy, resources, talents, even my vacations to expand the Gospel. There are, of course, similar utterances to be found among the sayings of our Lord, who made it clear that one cannot serve both God and Money. It is sad to reflect that many scholars think Paul incapable of writing such a letter as 1 Timothy, a conclusion based on a supposed incongruity between form and substance -- dense and inspissated sentences replacing the broad generalizations and airy thoughts of the "authentic" Pauline epistles. Here the topic of pseudonymous authorship rears its ungainly head, which we must of course discuss in detail in class next week. 11:30 AM I can remember only one semester since I was six years old when I was not in school as student or teacher. Even during my sabbaticals I am teaching in some foreign land. I must dispense many thousands of words on a weekly basis through public speaking or publishing. Still, I am realizing that the more I speak, the more I need to be silent if I am to remain true to what I say. "In much speaking thou shalt not avoid sin" (Prov. 10:19). I think we expect too much from speaking and too little from silence. Even the great orators of the past knew the value of the "pause for effect." Without a continuing rhythm of prayer and solitude, public speaking would become just a series of useless utterances. Then why do I fail to make prayer and silence a major part of my teaching? It seems crucial that I make a concerted effort to listen to God before I preach or teach or speak to others. I see the importance of a better integration between my devotional life and my work. But I have a problem actually doing it. I think the only solution is to set a prayer schedule and never depart from it without consulting the Lord. Make prayer the most important task of the day. Make prayer for my students as important as my lectures to them. All this seems very convincing to me, even obvious. The only task left is to do it. 11:21 AM I am taking the morning off from work, resting up from my head cold of the past two days. Nate's got some help, though -- two friends who volunteered to spend their time and energies doing the necessary grunt work that I normally do. Et moi -- what to do other than write? 8:57 AM Unexciting news here. We go back to work on the chimney today, and then I must give a good deal of thought about the talk I am supposed to give in the course of the wedding supper a week from this Saturday. Nathan and Jessica's relationship is so pure, so simple, so unadorned, so unencumbered by societal and ecclesiastical tradition -- I think there is so much that is scriptural about all this, hence the question: which Scriptures do I use, and which do I leave out? I have asked the Lord Jesus about this but have not received any clear direction yet. All in good time. 6:23 PM The latest addition to our home page is called Bush's War. 5:29 PM A big Wednesday shout out to the students from Union University in Jackson, TN, who visited our New Testament class today. Glad you could join us. And glad to hear your school is recovering from the tornado. I also want to thank those students who were kind enough to read aloud in class today from our essay on the discourse structure of Philippians. You did a magnificent job. What a load to carry! Above all, I thank God for the message of Philippians. Certainly all of us must have an interest in the spread of God's Good news outside of our own circumscribed bailiwick. "Laymen" have their contribution to make if they are trained in righteousness and the Word of God and have a sense of mission. Oh the unity we have in Christ, if we would only unify around the Gospel! Next week we'll discuss in detail the requirements for spiritual leadership in the church as we study the book of 1 Timothy. I have already decided to focus on the spiritual requirements, which we can often prattle away from memory but which too often flow from our mouths without much meaning. Following Christ was no complacent status quo then nor can we allow it to be so now. Of course, that was when being a follower of Christ was to risk your neck. But I think those days are not too far off for us today in America. Meanwhile Becky and Nathan have gone off to visit Jessie's family in Franklin. Becky will love their home and animals. Nate will be teaching from 1 Corinthians 8 tonight, but I will have to miss it because I am running on 4 (out of 8) cylinders and can't stop sneezing. I am sad that I will have to forego his insights. One more thought on today's class. Despite the honest effort I make to be understood, I feel such inadequacy trying to communicate to my people a particle of what I have seen and felt, heard and pondered through my own study of Philippians. If I could expand these 3 hours into a 3 semester study we might do a bit better. Most of us have so little background in language or linguistics, so little knowledge of history, ancient or modern; our roots are so thin and brittle. I studied absolutely nothing about how language works when I was in college and seminary, and history was too narrowly ecclesiastical to be dignified as history at all. Very few relations were established between Christ's Body the church and the body of society. It was as though the Divine Word had been incarnated in ectoplasm. The social scientists, as well as biblical linguists, have guided my continuing effort to understand the what and the how, the why and the when. But alas! There is still so much to know, so much of the text to read, so much of ancient history to study, so many tangled strands to plait into the tapestry that we call Scripture. Even when we apply ourselves we can know so little and only then at such a price of persistent toil. Still, I must hold up the Light. That's all a teacher can do, really. But I do pity my poor students, who must feel like they are drinking from a fire hose. 4:58 AM O, what a writer is F. F. Bruce! He has a very clear, hard, and acute intelligence and very considerable knowledge, not merely of biblical subjects but of history and even literature. He is a stimulating companion. No wonder why so many Americans studied with him in Manchester. On the farm front, we have begun to have some warmth, real warmth, but the spring season is by no means well established and the weather, instead of being set, is still variable. This past weekend saw perfect wedding weather (our celebration will be outdoors), and one can only hope for a repeat performance in less than two weeks. Rain or shine, however, we will still have daffodils, and the red buds will be in blossom. Nathan told me the other day that he had always wanted a spring wedding. Isn't God good? 9:04 PM Our precious Shiloh passed away 10 minutes ago. He had been at death's door for several days. He died quietly on the floor in our kitchen. He was a part of our life until the very end. Francis of Assisi saw every creature as a messenger from God. The cricket, the donkey, each told him something about their common heavenly Father. They spoke of God's love and power, His creativity and majesty and kindness. We are made for community, he said. We are interdependent. We must share ourselves with each other if we are to be truly human. I think this includes the animals around us. In this blog I tell about goodness and glory, but also about weakness and death, because I write about the human condition. The whole creation exists to worship God, and that includes a 55-year-old man who loves his animals deeply and grieves when they are gone. Shiloh was a gift of Creation, created by God for my enjoyment but not my control. He that giveth has taken away, and His name is blessed. Shiloh was with us since he was a brand new puppy, a total of 12 wonderful years. He was the last of our animals that moved with us from California 10 years ago. He will be buried tomorrow in our farm cemetery. Goodbye, our precious puppy. We loved you. Thank you for loving us so well. We will miss you. 6:48 PM Nathan never did call. He couldn't fix his well. Seems he needs a new water pump. So we took Jessie to unload a trailer full of manure. Here's her very first fling. Nice form, eh? Then she learned how to drive our "farm vehicle" -- Nate's Club Wagon. Go Jessie! All in the life of a funny farm family. 2:37 PM Today Jessica and her mom and aunt came a-visitin'. It was Becky's first time to meet our new daughter in person. After Becky had served a delicious lunch of tacos and fajitas, it was time to open presents to Nathan and Jessica from their friends and loved ones in Ethiopia. Here Jessie models a traditional costume given to her by the church in Burji. Right now everyone has gone off to Nathan and Jessie's farm, where Nate is fixing his well pump. He tells me he might want to work on his chimney this afternoon, so I'm "on call." The day started off cold and dreary, but the sun is now peeking through the clouds, and I wonder if the sheikh being with his sheikha had something to do with it. 9:54 AM Last Saturday we were visited by some JWs -- four dear elderly African-American ladies, with whom I had a most delightful chat. I politely refused their tracts and tried to turn the conversation toward the Scriptures when out came a colorful pamphlet with an overview of their work in about 50 languages. When they heard that I was a Greek teacher, they excitedly turned to the page with Modern Greek, while I duly read aloud and translated -- along with the German, French, Italian, Spanish, Portuguese, and one or two others. I attempted -- and succeeded, I believe -- to be as pleasant as possible, even though our theologies scarcely matched. "Aren't you glad we both believe in Jesus?" the eldest asked, speaking for the group. "Yes, indeed," I replied, adding, "But who exactly is Jesus -- that is the question." "But we are all children of God," she insisted," because we have all descended from Adam and Eve." "It is true that we are all God's creation," was my reply. "But only those for whom the Christ of the Bible is Savior and Lord is God truly Father." I had to excuse myself as I was in the middle of mixing mortar, but I said that if they should ever come back again, they would have to agree in all subsequent conversations to use only the Bible, "in the original languages," I quipped, at which they broke out in laughter. How can we stand by without compassion and love for such people? I cannot comprehend the fundamentalists who revile them, tear them down. Surely one can have compassion without being rude. It is supreme uncharity to treat them as witches, yet that is in fact what we do. It shows our fear of them. I am a fundamentalist when it comes to the fundamentals of the faith. Yet how odd that both sides, clashing with different theologies, so often conspire to destroy the true nature of God while attempting to substitute for it the madness of a particular brand of fervor. As those dear ladies drove down our long gravel driveway, I prayed for them, that the One who has the power to open blind eyes to false teaching would do so -- and in the same breath I asked myself, Where were the men? 9:48 PM Tonight I am drawn to Hendricksen's commentary on Philippians. He has put his considerable insight at the service of students -- if they would listen. I like his application of the Greek text the best. Read him and see for yourself. All are welcome to share his clarify, his wisdom, his seasoned judgment. I like his depth too. Contact with such minds is a rare pleasure. Most of today's commentaries pale in comparison (same old, same old...). 9:20 PM Our cantata music went quite well today, even though our choir director took ill and was absent. Of course, the Easter traditions I have long felt to be nothing but glitter. The obsession with institutionalism and ritualism is something the evangelical church has long possessed. Yet the Holy Spirit is still at work in our institutions and rituals. Love is more important than the external forms of "doing church," and a small, apparently tradition-bound congregation held together by strong bonds of love may be of far greater significance than an apparently "New Testament" church that is in reality permeated with an over-emphasis upon the wineskins. The reality of genuine friendship, spontaneity, and spiritual liberty is of the greatest importance, and too much emphasis on the externals can be stupefying. For me, today's glitter ceased to matter. It was, in one sense, even beautiful. 8:55 AM My brief message this morning was taken from John 21, where the risen Jesus feeds the disciples breakfast. Christ does not live in a sealed vacuum but has infleshed Himself in a world of 3-dimensional humans. He knows that our souls inform our bodies with 5 senses, and a stomach. In the simplest equation this means food -- "Come and eat breakfast." He knew they were tired and hungry. He, the Lord of glory, the risen, resurrected, ruling Savior, serves them a meal. The Lord's Supper becomes the Lord's Breakfast. If we are to follow in His footsteps, we must serve others like Him. This "mindset" (Phil. 2:5) is ours with Christ and in Him and through Him. But the privilege implies great responsibilities! Thus was my simple challenge from God's Word to our community here in Southside Virginia -- neighbors, friends, farmers, and fellow pilgrims and strangers on earth. Nathan has already picked out the mantle from his storage barn: massive and hand-carved. His house is beginning to look more and more like the set to the movie Gone With the Wind. Just beautiful. It was warm today, a pleasant 70 degrees, and I'm growing accustomed to the spring-like weather. To Becky it feels cold (it was very hot in southern Ethiopia). Most exciting of all: Our cutting season will soon begin. But first things first: we've got to finish the chimney. The next step is to get the stone mantel upstairs and in place. I asked Nathan, How in the world are we going to do that? He replied, "With great difficulty." A man of few words. But he'll figure something out. 5:03 PM Today while working Nate asked me a question I had never been asked before: "What time did you get up in the morning when you lived in Hawaii?" We were discussing the fact that we'd have to arise early tomorrow for the sunrise service. I had to think before answering it. I told him that my daily schedule all centered on my surfing life. If it was a school day and I couldn't surf until that afternoon, I got up just in time to get to class. If, on the other hand, it was during summer break or winter vacation, I was normally up and out of the house by 5:00 am. We always tried to get to the North Shore before sunrise to beat the crowds. I can still remember being able to hear those monster waves long before we could actually see them. We would surf until about noon then head back home and pig out at one of those plate lunch drive-ins. (Anyone who has lived in Hawaii knows exactly what I'm talking about.) Nate asked me if the waves were better in the morning or the afternoon. 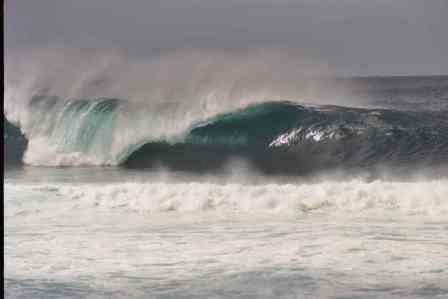 Interestingly, local weather conditions rarely affected surfing conditions in Hawaii, at least with big waves. These were generated by storms thousands of miles away in the Aleutian Islands. On the other hand, for smaller waves (Ala Moana, Waikiki), the waves tended to become windblown and choppy in the afternoon as the trade-winds picked up. Did I ever surf when there were NO waves? All the time. I surfed EVERY day, waves or no waves. Surfers are the world's ultimate optimists, and we always "knew" that a big wave was just over the horizon! Below: One of my favorite spots on the North Shore, the Banzai Pipeline on a small-sized day with perfect conditions. Takes your breath away, doesn't it? 4:32 PM Because of this horse, my life was made more wonderful. I lost him to cancer exactly 3 years ago today. How often would I give my friend a whistle and he would come ambling over for a rub and some oats. Conquering that Everest called riding became a consuming passion for me. It seemed as impossible as leaping the Empire State Building. But Cody was a good teacher, and finally I learned how to walk, trot, canter, gallop, and RIDE. What memories! It was obvious why Cody and I were such good friends. He loved me, and I loved him. That love grew with every experience we shared. Today I daydreamed about riding Cody and the years of pleasure we shared together. Odd isn't it -- the pain of missing him is still present after all this time. Spose it always will. 8:21 AM I am still hoping we can hold a conference on patristic hermeneutics next year. Of course, I have a deep personal interest in the subject since chapter 2 of my book on the Gospels is nothing but a fresh translation and interpretation of the fathers. To put it plainly,Why Four Gospels? attempts to show how in actuality a Baptist living in the twenty-first century is able to read the early fathers and identify with them as much in the same way as he would read a modern author like Carl Henry or Donald Bloesch. This is not to say that I am in perfect agreement with everything in the fathers. In the first place, these writers are not always in agreement with each other, and all of them make statements that a Baptist would not readily accept as they stand. Nevertheless, these writings have proved relevant and stimulating to me in an evangelical context. One paper I listened to in Dallas pointed out that the fathers need to be exegeted in the light of the normal rules of interpretation. This is one of the things I have tried to do in the last few years of my own academic life (Origen being a case in point). Doubtless I myself have been guilty of misinterpretation, and I still feel somewhat of a "bystander" in that none of my degrees is in Dogmengeschichte. Should that preclude one from studying the fathers? I think not, and I am growing daily in my appreciation for their works. 7:59 AM Becky's body clock is 8 hours ahead of mine, so she was up bright and early this morning. She's got to reorient herself to farm life, then begin preparations for hosting several hundred people at the farm, plus all the normal chores that go with the house and homestead. She looks great (in fact, really great) and is successfully fighting her head cold. Nate just now walked up to our house and I can hear them yakking away in the kitchen. Such a lovely sound. We've got a lot of catching up to do, so it may be a while before Becky can publish a report of her trip, though when she does, be prepared to sit at your computer for a good while with a strong cup of coffee. 7:02 PM God indeed hears our prayers. I just brought Becky home from the airport. This joyful experience has dominated the entire day. And do you know what she had a craving for? Mexican food. It is indeed a season of joy! There is no longer any doubt that her trip was perfectly timed. The last 2 and a half months have revealed to me how demanding -- and delightful -- the love of the Lord is. I can never be happy unless I am totally, unconditionally committed to Him. And what a joy to be "single-minded" with one's spouse and to "will one thing." By allowing the Lord Jesus to be the center of one's marriage, life becomes so much simpler, more unified, more focused, doesn't it? In every respect, then, a day of great rejoicing. His Light has shone in the darkness. In a million ways I feel indebted to you, dear reader, for the unbelievable beauty of your prayers. What else can I say but "Thank you!" The Kingdom is composed of those people who are characterized by two things: First, they have heard the Gospel of Jesus Christ and have embraced the salvation it offers. Second, they have been taught the teachings of Jesus as Lord and have a heart of willing obedience to those teachings (Matt. 28:19-20). This is precisely the attitude we have lost in the American church, because we have lost our fundamentally biblical view of Jesus. We are concerned with "success" rather than faithfulness -- with "practicality" and "efficiency." We thereby become the prisoners of self and lose all sense of values. Claiming to love God, we have in reality dispensed ourselves from all obligations to love anyone and are content to remain in our little circles and cliques. O Father, let me today be free from false Christianity. Let me have a "willing heart of obedience" to follow and serve Thee whithersoever Thou leadest me. Forgive me for being content to remain in my clique. Let me hear Thy voice and obey it -- immediately and without equivocation. 8:49 AM In Dallas a relative asked me why I blogged. I told her that my blog is nothing more than a personal interpretation of my world. In elaborating such a version one inevitably tells something of oneself. But my blog is not meant to be a venture in self-revelation or self-discovery. Nor do I offer "answers" to life's pressing problems. I do have answers, but I think I have more questions, and I question nothing so much as the viability of "expert" answers, including my own. Maybe the best way to characterize my blog is to say that it consists of a series of sketches and meditations, some literary, some poetic, others theological and even linguistic, fitted together spontaneously and in such a way that they react upon each other. I simply record ways in which I view the world, or a small part of it, without attempting to be formal or even organized. 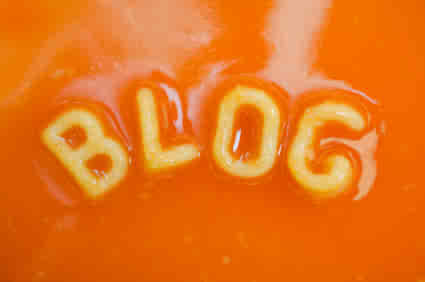 To put it plainly, I blog because I enjoy it, though I do not delude myself that I am saying anything of eternal value. I also feel a responsibility, in a sense, to enter the world of ideas by offering at least a few contemplative and introspective ideas of my own. That is one of the things this blog attempts to do. It gives a personal view of contemporary questions -- with a touch of farm life thrown in for the reader's amusement. Of course, I did not say all of this when asked why I blog, but if I had had the time it is what I should likely have said. 7:46 AM The latest addition to our home page is called Beyond Lone Ranger Christianity. 7:11 PM Had a superb nap. My feeling of fatigue and lassitude is gone. Went back to work with Nathan some more. We're now working from the second floor, Gott sei Dank. The puppies were happy to see Nate, and I think the feeling was mutual. After all, this used to be Sheppie's house too. I've now come back to Bradford Hall to prepare supper. While walking with the dogs I thought to myself how enjoyable farming is: getting into great shape, learning some manual skills, knowing more about animals and trees, getting to do challenging projects. I snapped the photo below on the walk home. Nate and I are both huge chicken lovers. I'm not sure why. Yes, we enjoy their eggs, and their meat. I guess by watching them we also become aware of the simplicity of life as God intended it. I am overwhelmed by the realization that for most of my adult life I had no inkling of that. 2:59 PM My word, but Lawrence Vance slices the cake with this essay on perpetual war. What he says about our religion of nationalism is interesting (Roosevelt once referred to our "preparedness for ever" in order to crush evil in the rest of the world). It really makes one gasp. One wonders which is greatest, the inanity or hubris of our leaders. I think it is their hubris. The ideas that inspire them are fundamentally rooted in egoism, as in Machiavelli'sThe Prince. Contrast that with one of Machiavelli's contemporaries, Erasmus of Rotterdam and (if I may also remind everyone, if only because I used to live there) Basel. Erasmus'sChristian Prince is truly marvelous, the very opposite of Machiavelli. Both authors remind us that there is nothing new under the sun, that despotism always settles in the saddle when it is allowed to do so by the masses, and that men of genius are just as susceptible to revving up the God-machine as the rest of us are. A future of poverty, hunger, and dirt looms menacingly. But who in America really cares! This is indeed where the love of Jesus comes into play, or ought to. I never feel that I am performing a wholly worthwhile act except when I am serving others. Then and only then one is not wasting time. 2:38 PM Right now Becky has just checked her luggage at Bole Airport and has gotten her seat assignment for the leg to Amsterdam. Her flight leaves in just over an hour from Addis. Then it's on to Detroit and thence to RDU, where she will be met by one happy feller. Meanwhile, Nate and I are preparing the farm for a very special occasion. Only 16 days to go, in fact. We just got back from unloading a trailer-full of scrap iron at the local dump. Got a whopping 60 bucks for it, too. It's stuff that needed to go, as we always need more Lebensraum at the farm. Also picked up more sand and mortar in South Boston. I am taking the rest of the day off, until I have to cook supper, that is. My left foot has proved very tiresome and it drains me of my energy. But the donkey work has got to be done, and in the nature of things I am the one upon whom this work normally devolves. Next week a DBO reader (whom I've never met) and his college-aged son are coming over to help us with farm work, and their work will be greatly appreciated by this father-son duo. Since my recent travels, my margin of reserve strength has somewhat diminished, but it's nothing a good afternoon nap can't take care of. On the whole, the work here is demanding but quite pleasant, though on occasion I am tempted to strike for higher wages. 8:27 AM My week off from teaching draws to a close. Today it's back to chimneying. Tomorrow we pick up Becky. Then it's back to the classroom. I do miss my students: knowledgeable, talented, generous persons almost to a man, many of them husbands and wives who really want to put on Christ and make Him the center of their being and have Him grow inside of both of themselves, so that they may more truly be conjoined to Him. On Sunday I will speak about what Christ's life is all about, both in 33 AD and in 2008 AD, and next year and next century. We have in our association of churches many elderly folk, and I do hope that the service will be moved indoors (a low of 34 is anticipated for Sunday morning). I certainly desire to avoid your stereotypical Easter sermon. Intriguing how words lose their power, how they just peter out! They grow old and tired and empty. Easter is an old worn-out word. To the mind's eye it conjures up bunnies and hard-boiled eggs and church-wide breakfasts and cantatas. It is, of course, much more than that -- as well as much less, for every Sunday is resurrection Sunday. God help me to do more than preach a "good Easter sermon"! 8:15 AM A former student of mine emailed me this morning to ask: Did Jesus say to Mary, "Do not touch me" (NET Bible) or "Do not hold on to me" (God's Word) in John 20:17? The latter is certainly in keeping with the Greek syntax here. 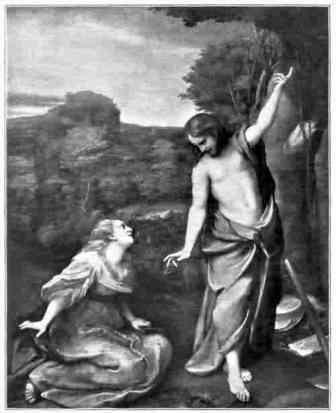 Titian has a painting of Mary cringing in fear at the feet of Jesus, afraid even to touch Him. It is more likely that Mary has already embraced the Lord. She wants to hold on to Him the way He used to be. But there are things the risen Jesus must do yet. If she doesn't let Him go, she might miss out on these blessings. Instead, she must go and tell the Good News. "Tell them that God is doing something brand new, and you yourself have seen it!" Now and again we must withdraw from the pressing demands of business and home, forsake the relaxing small talk of the coffee table in order to penetrate more deeply into this commission that Christ died and rose again to give us. As Nathan taught us from 1 Corinthians 7 last evening, husband and wife find unity in seeking Christ together. Seated side by side they ponder the same Truth, thrill to the same Love, follow the same Way, move to the same Life -- even if at times this calls for temporary separation. To be fused into one by the flame of God's love -- that's the great uniqueness of a Christian marriage. Let us not cling to our spouses, as if marital happiness were the goal of life. Let us live for Someone bigger than us by telling others this great Good News. 2:34 PM Eric Carpenter doesn't celebrate Easter. Good for him. If I were a theologian, I might put it this way (pardon the analogy, but I've got marriage on my mind these days): To wed a pagan holiday with Christianity is not only a marriage beneath the church's dignity, it is emotionally unsatisfying, logically repugnant, and ontologically impossible of consummation. Take that all you Easter-egg-hunters out there! What, then, will I be doing this Sunday, you ask? Preaching at our regional Sunrise Service and then singing in our church's Easter Cantata. "You hypocrite!" Okay, maybe. But I'm preaching because our pastor is recovering from an automobile accident and asked me to substitute for him, and I'm singing because our choir director desperately needs basses and "insisted" (in a very friendly way) that I help the choir since I wasn't on the road this weekend as I usually am, etc., etc., etc. Folks, all I can say is that I will feel no closer to Jesus on this "Easter Sunday" than on any other day of the year. But I will feel close to my brothers and sisters because I love them just the way they are. If that doesn't make any sense to you, join the club; I hardly know what to think of it myself. But how can I make progress in my community if I jettison my friends simply because we don't agree on secondary matters? These are the same people who love me and Becky unconditionally and who pray constantly for us and our work. I once put it this way in class: "I do not know of any family that is not at least partially dysfunctional, and I do not know of any church that is not the same. Why should I exchange my dysfunctional church for your dysfunctional church?" As Bush senior would put it, "Nope. Ain't gonna do it." 1:55 PM We've heard from the world traveler! She's back in Addis Ababa, putting the final touches on her busy 10 and a half week trip. After her meetings in Burji she met with the director of medical work in Awassa, then with some friends from Alaba (who actually drove to meet her in Shashamanee), and is now back in her "palace." Believe me, I do not take this for granted. Nor would you, if you ever traveled on the infamous two-lane "Pan African" highway at supersonic speeds. 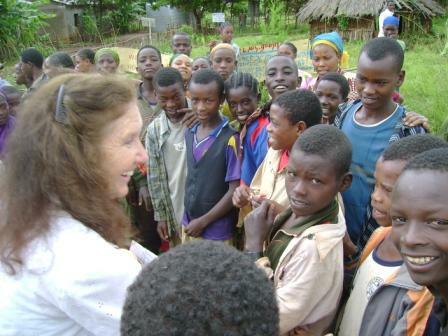 Becky also said a brief goodbye to Aberesh, Tilahun, and Baby Nathan in Dila. I look forward to debriefing with her after she returns. There will be much to talk about, and many important decisions to make about our work in Ethiopia. Not to mention a wedding to prepare for. Please do not forget to pray for her. She said she thinks she might be coming down with a head cold. The only news here is that we have taken a bit of a break from working on the chimney to play catch up on other projects today. In my case this means running errands and deep cleaning the house in view of the parousia (note the small "p"), while Nate is taking care of odds and ends over at his and Jessica's farm. I did want Mama B to catch a glimpse of home life one last time before she jumps aboard her big jet liner tomorrow night. Here Liz and the boys help Nathan celebrate the big two five. Nathan is wearing an exotic wedding hat I bought for him in the Middle East. He balances it nicely on his head, don't you think? Here Mr. Micah prepares to entertain us with his rendition of Happy Birfday. At one point all three pairs of hands were doing arpeggios. Magnificent. Finally, I couldn't resist posting this pic. Look at what I pulled out of our vacuum today. No wonder it was sputtering. Not to worry, though, honey. Yours truly has now vacuumed the entire house and even mopped all the floors (if you can believe that). Your house should be spotless (by male standards, of course) when you arrive home! To end on a more serious note: Undoubtedly Becky will be exhausted when she gets back. She has given and given and it's not over yet. This is her nature. There are many ways of saying, "I love you." But I can't think of a better way than simply helping out a brother (or a sister, as in this case), can you? The world's in a mess. The world's torn asunder by hate. Only love can cure this hate. Only Christ's love. But love can be demanding, and so much more difficult that gallivanting around to gawk at the world's marvels. Unless I am badly misjudging, my wife qualifies as a Proverbs 31 woman in every possible way. But it is Christ living in her. To take just one example: her occupying temporary quarters wherever she went. She never fretted about that. Her thinking was: "Well, has not Christ occupied temporary quarters before I ever did? Remember, there was only a barn on the night He first arrived." Such love, Christ's love, we have discovered, opens up great possibilities and responsibilities in Ethiopia. But it is all God's work. Christ did not abrogate but rather confirmed by His own life the commandment "bear one another's burdens" as well as "and thy neighbor as thyself." May His great name be praised forever. 8:22 AM The latest addition to our home page is called Contemptus Mundi. 7:16 AM In the past few months I've had some very stimulating discussions with students who are interested in pursuing doctoral studies. I find these discussions immensely profitable. My constant plea is that we invigorate the academy not only from the top downward but also from the bottom percolating upward. I feel I must do everything I can to encourage a grassroots ferment of intellectual life in the church. The best scholarship is a vineyard that not only grows into the airy reaches of the academy but that likewise sinks its roots into the earthy soil of the workaday world. As the apostle John might have put it, verbum incarnandum est. The scholar is to incarnate Christ, not only in the classroom but in his personal, professional, and political life. We must conceive of education as affecting all of life. I am thus very excited when I see thoughtful, mature, and dedicated students making pioneer forays into scholarship, and I find myself doing whatever I can to help them on their way. Such scholarship -- the hard discipline of study, reason, and deliberation, all in the service of the church -- is, I believe, most urgently needed today. 6:57 AM I am a Thomas. The name means "twin," and the early fathers often commented that all of us are "two people," a doubting one and a believing one. It is very important, I think, to be deeply aware of this. 6:45 AM After the live radio performance of Brahm's Requiem on Monday night, the audience began applauding, and applauding, and applauding. No commentary from the radio announcer. Just unending clapping and cheering. So God has created us to be His audience. We exist to applaud Him, encore after encore. We who are the church are to live to the praise of His glory. Sometimes I think I have barely begun to perceive the breadth, depth, and dimension of this privilege. I pray that my students may see me loving God with more and more of my strength and loving my neighbor with a greater fraction of my own self love. 5:29 PM Brief farm update: This weekend Nathan was eager to try out Hercules. With his new track loader we can do in 5 minutes what would take us at least a week to do by hand. This is the "farm" way of doing things. Save on labor when you can, but do it the hard way if you must. Personally, I find much consolation in having Hercules around. No more back-breaking brush clearing. I can now wear myself out by hauling bricks and mortar. Sometimes I wonder: Am I growing old? To "grow old" is to live life less as an attempt to conquer new territories and more as a grateful response to the good gifts of God. There's no doubt that I'm aging. Everyone does that. But I refuse to "grow old" yet! At any rate, here are a few pix for your agrarian amusement, beginning with the "damage" old Herc did behind the new hay barn. This morning Nate sold this flooring and make a purty good profit too. Craig's List is really something. The soon-to-be-wedded farm manager couldn't wait to show me the new stone mantel he scavenged up from a neighboring farmer. It was too heavy for even two men to lift. Nate hauled it to the farm with his tractor, then rolled it to the base of the chimney using logs, then hoisted it up with his hydraulic lift. Nice job, don't you think? This is how far we got today. As the ancient Chinese proverb puts it, "A journey of a thousand miles is made one brick at a time" (or something like that). Onward and upward! The daffodils are everywhere on the farm. All because of the foresight of Nathan, who planted them years ago. They sure brighten up our life here. 9:58 AM Jessica tells "the story." 9:29 AM Becky will return home in exactly 4 days. "Absence makes the heart fonder," it is said. Isn't this true of all important relationships in life? I wonder if the first apostles felt the same thing when Jesus left them. When He was with them for three and a half years, they could never fully comprehend His presence. Only after He had ascended did they understand how close to Him they had really been. I have never "seen" Jesus. Yet I miss Him. "Although you have never seen Christ, you love Him" (1 Pet. 1:8). The only reason I am here on this earth -- I mean, the only reason I should be here -- is to love Him and serve Him until I see Him "face to face," "as He is." Meanwhile, all I am has become "waiting." 9:14 AM While visiting an Asian country recently I was ushered into a church sanctuary and shown its brand-new stained-glass windows from Germany. It struck me that teaching is like that. My task is not to make beautiful windows but to help my students see them. Only by entering with me into the experience will any real learning take place. I often wonder, Do they see the same colors I see when the sunlight shines through the windows of my Greek New Testament? This is the side of teaching I tend to forget. I cannot "see" the stained glass for my students. In the end, all learning is self-learning. 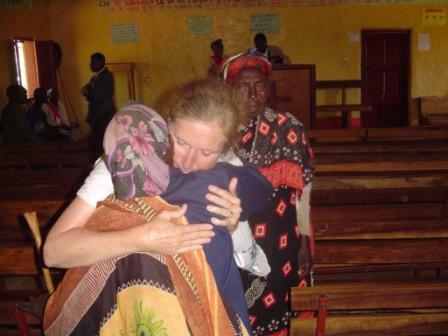 1) Becky met with the civil authorities in Burji and then was asked by the church elders to meet with the government official who oversees all medical work in southern Ethiopia. I have not had a report of that meeting. I'll let you know as soon as I hear. 2) I am attracted to joyful scholarship. Dale Allison's plenary paper at the conference was exemplary in this regard. There was nothing of the "dolorism" one often finds in key-note speakers. Thank God! 3) I met many students at the meeting. Eager, bright-eyed, optimistically anticipating the future. I was able to share with them a few thoughts on education from my own academic pilgrimage. We had some very enjoyable conversations. Made me miss my own students. Every time I think about them I am reminded of the need to pray for them. Even small tasks such as memorizing Greek vocabulary can become an anxiety-provoking burden. I pray during certain hours but especially while walking to class. In prayer I have a chance to serve my students as much as during my lectures, perhaps even more so. There is always a great temptation to do our work in the flesh, whether as teacher or student. But for anything of eternal value to be accomplished the work must be spiritual from beginning to end. During the last few weeks I have begun to realize this more and more. In prayer we have a chance to open our hearts just a little to God and seek His promises to those who wait upon Him in faithfulness. Even when I feel a total failure after lecturing, as I often do, I know that my prayers for my students are not in vain. 4) The TV in my Dallas hotel room had a zillion channels and one of those giant analog screens. I did not watch it much, as there was little of viewable value. I thought of the irony: millions of dollars spent by producers and station owners to lure the viewer, who finds nothing worth viewing. C. K. Chesterton wrote in his book, St. Francis of Assisi, that Francis was the most joyful of saints though he was a severe ascetic. His joy about all that God created was born out of his realization of its dependence on God. TV is the nemesis to this, I think. "How interesting, how fascinating, how insightful" -- I can say this of books but not of the one-eyed idol. 5) I spent Sunday evening and Monday morning with Becky's mom and dad. I spoke on missions at First Baptist Church Murphy then we went out for Bar-B-Q, real Bar-B-Q. I ordered a full rack of baby back ribs. Yesterday we enjoyed Ethiopian food at the Lalibela restaurant in Dallas. Mom and dad will be arriving at the farm on the Wednesday before the wedding. They can't wait to meet Lady Jessica. They are in for a real treat. 6) What perhaps struck me most in this conference was the idea that modern biblical scholarship seems committed to new approaches. I tend to agree with the principle but still feel uncomfortable by the consequences drawn from it. The radical and even reactionary ideas being promulgated concern me. Part of the problem, I'm sure, is terminological. (One paper referred to "Jewish Christians" such as Peter as "Judean Christ-followers." Of course, Peter was a Galilean. Other terms being bandied about were "Second Isaiah," "Implied Reader," "Progymmasmata," "Gendered Ritual Space," and "Haggadic Concord." Why should a doctor tell you your child is turning blue when he can say he's "cyanotic"?!!!) On a deeper level I wonder how much of scholarly work has to do with ego inflation. Papers often reveal less about a particular topic and more about how the scholar thinks about himself and how important he has made his own ideas and insights. I could say more, but I'll leave it at that. All in all, a good conference and a great weekend. But I missed the farm and Nathan. 11:22 PM Back from Dallas. Just walked in the door. A marvelous trip. The best part? Driving home just now from the airport. The classical music station played Brahm's Ein deutsches Requiem (A German Requiem). O, what a Godsend! And how grateful I am that I know German! Selig sind die Toten, die in dem Herrn sterben, von nun an. Ja der Geist spricht, daß sie ruhen von ihrer Arbeit; denn ihre Werke folgen ihnen nach. I am so moved I can hardly write. Several years ago Becky and I sang this magnificent requiem with the Northeast Piedmont Chorale during our first year with the group. Is there a better place than heaven? The river of the water of life! The throne of God and of the Lamb! His servants shall worship Him! They shall see His face! Night shall be no more! For the Lord God will be their light! Am I living in the fall or winter of my life? It matters not! "Death, thou shalt die" (John Donne). Lobe den Herrn! 7:37 AM In case you're interested, here's the website for this weekend's meeting. I look forward to attending the following sessions (among others): "The Emergent Church: Ideology or Utopia?," "Topics of Encomion and Matthew: How Ancient Compositional Training Has Shaped the Structure and Content of the First Gospel," "Arguments for Q Revisited," "Breaking the Betrothal Bonds: Hospitality in John 4," "John's Gospel and the Imperial Cult," "Gendered Ritual Space and Early Christian Women at Philippi," "Democracy and Islam," "A Pauline Reprise: Unpacking a Generation of Scholarship," and, my favorite, "Complimentary Lunch." 7:24 AM I've had the privilege of teaching 6 times in South Korea in various seminaries. My favorite food in the whole world is Korean. I even have a Korean name! So is it any wonder that I should add to my home page essays in Korean? Special thanks to my assistant Dae Yoo (photo) for translating them for me. He's currently working on several others. If you see anything that should be translated but isn't, let us know. 4:52 AM Kevin O'Shaughnessy just posted a nifty photo and description of my alma mater in Switzerland. Check it out here. 4:49 AM It is early morning: beautiful, dark, very pleasant, a good day to soar at 30,000 feet. In a short time I shall look at the rising sun and feel that I see what my beloved witnessed 8 hours ago, the same sun and all of creation praising God for this day. I am looking forward to the ephemeral pleasure of academic meetings in Dallas, along with publishers conferences and, of course, some good Texas Bar-B-Q. "I am sure we honor God more," wrote Bonhoeffer, "if we gratefully accept the life he gives us with all its blessings, loving it and drinking it to the full ... than we do if we are insensitive toward life." SBL meetings are enjoyable, if curious events. In many ways, biblical scholarship is bankrupt. 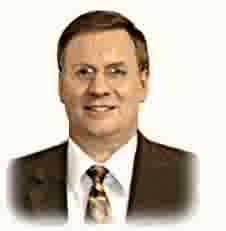 After centuries of "observation" and "investigation" we have lost our way in a desert of uninterpretable facts or -- to believe some of the world's leading New Testament scholars -- not facts at all but fictitious events, events that never happened, words that were never said but were put on the lips of the Jesus by His followers. Our doctoral dissertations only perpetuate the fraud. I will say it again (not that it really matters): arrogant scholarship is no scholarship at all. This has to be made clear to our students. Can't we do something more than give them nonsense? I, too, must repent of this sin and come to a turning point: shall I continue to clothe the truth in a good coat of inanity? Shall I continue to preach open-mindedness yet be so dogmatic? Shall I insist on clarity from my students yet obfuscate myself? Someday I shall learn how to teach! And why should our students not be taught to question things rather than sit around with rubber stamps in their hands? Such, then, are the rambling thoughts of a New Testament student and gladiator as he prepares to enter the arena of academic scholarship again. Should be fun. 6:52 PM It was on my very first trip to Burji near Kenya that I was suddenly overwhelmed with the realization that I loved those people, even though we were complete strangers, and that they were mine and I theirs, that we all belonged to God. The whole idea was preposterous. Who were these people? Why did I love them so? They were the members of a tribe among whom my in-laws had labored to build the first school, open the first clinic, and preach the Good News. I realized then and there that I had a responsibility for them as a result of the link between Becky's family and mine. Through my wife -- can't you just see her as a 10-year-old playing with the children of Burji? -- I am one with them. They are not "they" but us. Becky and I joke every time we visit Burji that she will build a little hut in the highlands as her second home and that I will come and visit her whenever I'm not teaching. We feel open, free, relaxed among these saints who live at the end of the road, on the top of the world, in the depths of our heart. Here I sit in the comfort of Bradford Hall, deeply struck by these contrasting panoramas. How often have we walked together from village to village! When we are with them we feel our own strengths and weaknesses without any praise or criticism from them. When I am in Burji, at the top of the world, it seems that these are the most precious moments of life. This weekend the little girl who grew up in Burji will not be anticipating being back home; she will actually be there -- living a simple and sober life, not trying to be different from them in externals, working with them and expending her time and energy. My mind has a picture of people embracing each other with tears of joy! It is this understanding of love that I must slowly learn. My love too often proves to be tentative, a momentary attraction. Indeed, how divided my heart is! I want to serve God but also to be a "success" as a teacher and speaker. I want to follow Christ but also to be popular and liked by others. "One thing!" Paul said (Phil 1:27) -- then why am I double-minded, double-hearted, doubly-devoted? Today Becky is proving that you cannot serve God and mammon, you cannot follow the Savior just a little bit. It's all or nothing. Dear Father, may Thy love fill not only the night with songs of peace but the wide ocean stretching between two continents. And may the one I love feel Thy embrace even as she embraces her past. I pray that the immense greatness of Thy love will shine into the darkness of Africa until all of our hearts and minds are directed toward Thee! 5:34 PM The Bible says, "With sweat on your brow shall you eat your bread" (Gen. 3:19). Bread and sweat have never been closer in my life than now. After 5 years of manual work, I am realizing how much I really do enjoy it. Nevertheless, it can be boring sometimes. When I write or lecture I can always make things interesting by manipulating them in certain ways. But in hauling cement or bricks, it is practically impossible to make things really interesting. It is a "job" to do. Mundane work like this contains a hidden blessing, however. It shows how dependent one is on interesting, exciting distractions to keep one's mind busy and away from confronting one's natural sloth. I do hope and pray I learn this lesson from boredom someday! I did a pretty good job, don't you think, Jessica? Of course, I did have a little help with the "unskilled" labor. 8:20 AM The genius of the Protestant Reformation lay in its struggle with the problem of justification in all its aspects. For the greatest question of life is the conversion of man and his reconciliation to God in Christ. But Protestantism, once it answered this question biblically, failed to press on to treat Christianity in its most radical form -- the form presented in the New Testament. The Protestant teaching on justification, in emphasizing truth, sometimes leads to a neglect of the new life, life in the Spirit, life in Christ, life as Christ's body. Koinonia takes on a superficial and rather suburban goodness -- moral platitudes, covered dish fellowships, an occasional "mission trip" to the local nursing home or to a nearby state. The Christian life has become merely a fidelity to ethical prescriptions or participation in the multitudinous programs in our churches. There is little real sacrifice about it. Witnessing becomes a trite tract or a bumper sticker. Heb. 10:24 is cited to drive people back into church but not to encourage them to "provoke one another to love and good works." Passive spectatorism becomes par for the course. It is to the credit of the Jesus Movement of the 1960s (of which I was a part) and perhaps of the modern emerging church movement (of which I am not a part) that both sought to expose this hideous problem for all to see. There is a new generation and a new spirit at work today, and perhaps it will turn out to be the catalyst that will bring on our transformation from churchianity to a Christianity that is dedicated to the forceful living out of the life of Jesus in this world. In this regard, I would ask that you remember my dear Becky Lynn in your prayers today as she takes Aberesh and Nathan home and then meets this weekend with the civil leaders in Burji. We are attempting to apply the yardstick of "Gospel" to all we are doing with the health clinic. She will be doing much talking. But there is also a time to listen, and the better part of action sometimes is waiting, not knowing what is next, not having the big answer. We are ready to reopen the clinic this fall, but is this God's will? We must have unity all around for this to take place. 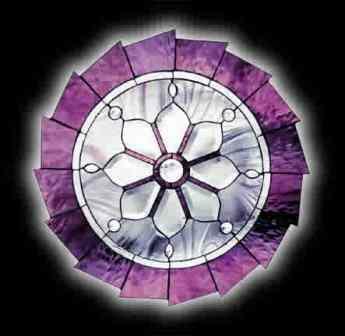 However, we do not feel we can compromise on the spiritual aspect of the work to make this happen. Harmony is not bought with parsimony. To stop in the right way is to go on. To leave things alone at the right time -- sometimes this is the "best" thing. How I wish I could be present during these meetings! Do pray that our Phoebe will not feel alone, that during these challenging days she will remember that Jesus is her Friend, and that His Spirit is always present. The important thing is simply turning to Him daily and often, preferring His will to everything that is tangibly "ours." 8:33 PM Truth is the meat of life. And how good it tasted tonight at Bible study! Nathan taught from 1 Corinthians 7 on marriage and divorce. We discussed, too, what the Bible says about remarriage and polygamy. A really fine evening. Earlier, when I returned home from Wake Forest, I found it necessary to spend a few lonely moments on the front porch in quiet prayer. The old desert monastics knew what they were saying when they coined the expression "fuge, tace, et quiesce" -- enjoy solitude, silence, and inner peace. God knows how fast the RPMs have been racing. I am beginning to discovery that it is exactly the lack of spiritual rest and refreshment that causes the heaviness in my heart. Solitude has great benefits. The challenge, I suppose, is to be solitary without becoming individualistic. Balance, balance, balance! 5:44 PM People are often surprised that I am not an ordained pastor. I have never sought ordination. God has not gifted me to be a shepherd-teacher (Eph. 4:11). Nor am I a deacon in my local church, since our deacons function as overseers and God has not given me the gift of oversight or leadership, nor have I ever aspired to leadership in the church (1 Tim. 3:1). What I write and teach is simply the experience and opinions of a working Christian, a man intensely convinced of the “layman’s” function in the local church. I have tried to demonstrate what the Scripture teaches about that function – about the “layman” in relation to the total mission of the church, and a very definite idea as to how every believer can find ways to fulfill that mission. 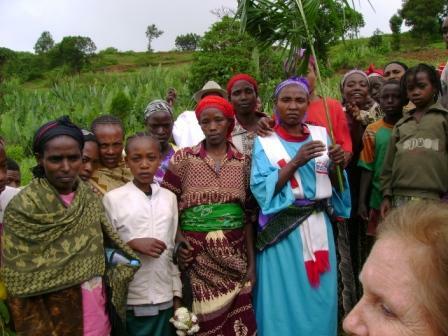 In recent days I have been relating the intimate story of a pastor’s wife in Ethiopia. The scene is Addis Ababa, but it could be any city in the world. It is a case where one believer saw a need and did what she could – as a “layperson” – to help. I am absolutely convinced that had not Becky been an aggressive medical advocate for sister Aberesh, baby Nathan would be no more. Why go to so much trouble? The answer is found, I think, in the little letter of Philemon, which we studied today in New Testament class. Here Paul does something very simple, so simple in fact that it is easy to miss. He calls upon Philemon to act as a Christian. When we were worth nothing, God gave us everything. This is how God acts toward us, and we in turn are called upon to take that same attitude and exhibit it toward all men, even our enemies. The mark of a true believer, writes Paul to Philemon, is that his actions toward his fellow men are governed by the love of God poured out into his heart by the Holy Spirit. God has given every believer a new nature, one characterized by giving rather than getting, by love rather than hate, by selflessness rather than selfishness, by forgiveness rather than bitterness. Since this is true of all believers everywhere, it should be natural and normal for us to want to help each other. The family of God to which we belong includes all Christians of all ages, all levels of intelligence, all levels of social strata, all nationalities. We are all “fellow citizens with the saints,” and therefore we are called upon to demonstrate the reality of our oneness in Christ in tangible ways. “Bear one another’s burdens,” says Paul. "Place your shoulder beneath the burdens under which a fellow believer is groaning, whatever those burdens may be!" The reality of our unity in Christ makes inevitable and inescapable demands on us regardless of race, color, age, denomination, nationality, or political affiliation. Yet individualism has shattered our churches and our communities. How can I give up my job, my health, my ease, my family for the sake of others? Our oneness is organizational, occasional, and spasmodic. If any unity appears it tends toward the back-slapping variety of the country club. Paul was eager to remind Philemon that the church is nothing less than a community of love: Christ-in-me loving Christ-in-you. And for this love to be real it must issue forth in forgiving one another's sins, bearing one another’s burdens, washing our brother’s feet, caring for our neighbor’s children, helping in the tiny incidents of everyday and the great emergencies of life. A heavy responsibility, then, lies on our shoulders. The church today must deliberately move toward this type of Christianity. But only Christ can produce it. The danger of dwelling too long on “our” service is that we soon begin to speak as if we had done it by ourselves. We can be sure that we contributed nothing in comparison to what Christ has done for us. It is His wonderful and mysterious love that is at work in and through us. How much reason, then, to pray that God will turn our hearts to Him and set us free by His love to serve others. As the drought makes me wish for rain, the clouds for the sun, the storms for the gentle winds, so my heart yearns for Thee, my Lord and my God! 5:24 PM A student came up to me today simply to tell me how much he loves Greek. He wants to master it, to read his Bible in the original. I'll take a dozen just like him. It was a delight to see such passion. Personally, I never tire of studying the New Testament in Greek. Such joy in reading it, and such agreement! I write this in my office at Bradford Hall, surrounded by books. But none is sweeter than my Greek New Testament. 5:10 PM Beautiful afternoon. Cool breezes. Blue skies. The young bulls lie under the trees. Flowers bend in the wind. A sweet spring day. I must enjoy it. This day will not come again. 7:37 AM Back to WF. Do I miss Rosewood when I'm gone? I need the farm as an Athenian needs Athens. I have developed a profound love of the countryside, but Wake Forest is the place where things happen and where I recharge my intellectual batteries. People drop in unexpectedly and are always welcome. I find there pleasant talk with people of all ages. I especially enjoy those who possess an inquisitiveness about things, a capacity for opposite points of view, and for relating facts to real life. The "ivory tower" has never held sway over me -- though I have always appreciated academic excellence (especially in my students) and the rejection of the tawdry. I feel ill at ease in the company of people who do not possess these qualities to some degree. I feel uncomfortable around people who are snotty and aloof and who seem "superior" to others, for I think that Jesus was being quite serious when He uttered the words of Mark 10:43. I believe the great Christian masses in America are insensitive to the ponderous issues of the day, but I am quite willing to work with them -- and with any genuine Christian in fact -- in getting the Good News of God's love out to the world. I remain an ecclesiastical optimist. I see the dawn of a new day for the church in which every Christian will at last become a minister of the Gospel and not just those who belong to the ordained "clergy." I always return to the farm with a fid of manuscript written on campus, in addition to various ideas for website articles and blog posts. So there you have it: I thoroughly enjoy Wake Forest, but I do miss Rosewood when I'm gone. 6:31 PM Found 'em! Ain't they sweet? Both of 'em males by the way. Sadly, this is how far we got on the chimney today. Ran out of concrete. But it was a start. All in all, a very good day. The sun shone brightly, you could almost hear the grass growing taller and taller, and seldom have I have gotten such good news in one fell swoop. Becky is happy and sounds so well and lovely. This great aching world seems so full of sorrow, but I know I should thank Heaven for all the blessings that have been showered upon me. I must now concentrate again on teaching and students: constant back-to-back meetings in between classes, plus chapel, plus emails, plus a trip to the bank in Wake Forest. What fun! 12:30 PM I am suffering agonies at the moment over the absence of my precious wife. When you get to bedrock there is really no substitute for one's spouse. (Yes, Nathan, I meanyou.) I just called Becky and we had a perfect connection. 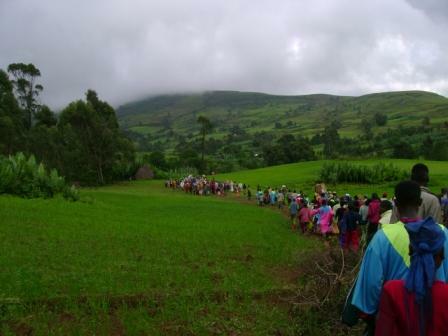 The good news continues to pour in -- plans are still ongoing to return Aberesh and Nathan to Dila as hoped for this Thursday and then to make the long trek to Burji in the high mountains of southern Ethiopia. After that, Becky will return to Addis and depart for home on the 20th instead of the 25th (she can't wait any longer, and I can't either). This will give her a grand total of 15 days to prepare for the event of the decade. We are already in the logistics mode -- who is arriving when, who is sleeping in whose house, etc. Right now Nate has run back to his home to sell the flooring he took up, then he's off to South Boston to get the fixins for the new chimney, whose foundation we hope to lay later today. Then it's "up and up we go, where we stop nobody knows." It seems almost a crime to alter or refurbish such a neat old farm house, but actually Nathan is restoring its old look in many ways and expanding it to meet the needs of a large family. Meanwhile I am being "domesticated" today -- sweeping, dusting, mopping, washing clothes, and deep-cleaning Becky's kitchen so that she won't have to do an archaeological dig to find her pots and pans when she gets home. Oh -- I am doggedly determined to find them new baby goats and snap some pictures for Becky Lynn before I leave for seminary tomorrow! 5:32 AM More good news from Ethiopia. 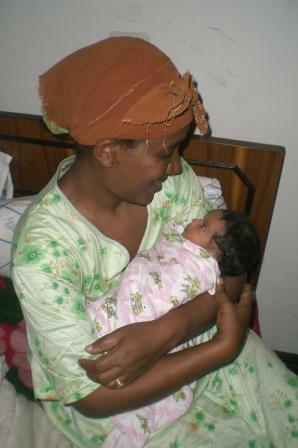 Becky, Aberesh, and the baby have returned to their rooms in Addis. Becky reports that Baby Nathan is doing wonderfully well. They are returning every day to the hospital for antibiotic shots. Becky hopes to be able to take Aberesh back to her home in Dila this Thursday. Then it's on to Burji and meetings with the civil leaders about the health clinic. Another answer to prayer: We were finally able to find a vehicle for the church in Alaba. It is a 12-seater Land Cruiser with luggage rack, all "in excellent condition." As we reported here, this vehicle will meet a tremendous need in Alaba. The country there is most astonishing and beautiful, but I've never been in any place, except parts of New Mexico, which gave such an impression of being hostile, even alien, to man. Humans crawl around in this empty vastness like irrelevant ticks, with dust spouts and temperatures of 100 degrees not uncommon. Now the church will be able to drive about it in a Land Cruiser -- just a functional vehicle without air conditioning or any of the other modern comforts of life we are used to over here. If all goes well, and with proper maintenance, that vehicle should serve the Lord's church in Alaba for many years to come. And so the good work continues, all because of the love of the Lord Jesus for the entire world. His love "has been poured out in our hearts like a mighty waterfall," the Bible says in Rom. 5:10 (the Greek verb is that wonderful term encheo). The deluge is so enormous that at times one is almost tempted to cry out, "Lord, I can't take it any more!" I've been up since 3:30 this morning rejoicing and praying over what He has done in the past week. Whirlwinds of blessing blow across the spiritual landscape of our lives, each blessing totally undeserved, each calling for nothing but heartfelt praise. One never ceases to be amazed at His mercies. 5:22 AM Yesterday Nate checked up on the goats after we got home and reported that twins were born while we were gone. So off I went, camera in hand, to document the event. Well, I couldn't find the newborns or their mama, but I finally located this cutie pie that was born about two weeks ago. He has the most unusual and interesting markings, don't you think? 8:15 PM Stop the presses! Just in from Ethiopia! Pictures of Aberesh and her baby! This one of Aberesh and Tilahun was taken the night before Baby Nathan was born. Mama B and her "other" Nathan! Aberesh is the picture of maternal contentment! Praise the Lord! Great things He hath done! To God be the glory! 7:47 PM Well, we succeeded in driving 600 miles in 2 days and had a pleasant and safe journey, thanks be to the Lord. Our first stop was in Franklin to visit with the Terry family. Their home is beautiful. Its seclusion and quietness reminded me so much of Rosewood. We walked around the farm, saw the garden and the pasture, met the goats, had a fabulous meal, and enjoyed rich fellowship marveling at God's gracious dealings in bringing their Jessica and our Nathan together. Of course, I say "their" and "our" but in fact Jessie and Nate have belonged to the Lord Jesus since the day were born and even before that. It was His purpose before the foundation of the world to unite them as husband and wife, and now in His providence and wisdom He is bringing that to fruition. As the photo below shows, Bobby and Michelle have three children (and one dog). From left to right, pictured are Conan (dog), Justin, Michelle, Jessica, Nathan, Bobby, and Jonathan. They live in a very rural setting in southeastern Virginia. (They are just within Nathan's "two-hour rule." If you want to know what that means, ask Nathan!) Their house was built in the late 1800s. It is surrounded by a big stand of pines and several large fields. Jessie and Michelle love to bake. Upon our arrival we were served freshly baked muffins and Hawaiian (!) coffee. Here they are preparing homemade pizza for lunch. Simply scrumptious. A tradition that both of our families have in common is our love of popcorn, though no one can make (or toss) it quite like Jonathan can. Jon's form was just a little off this day, but Conan was right there to handle the "overflow." Below, of course, is the reason for all the hullabaloo. I have already seen how Miss Jessie has brought out the man in Nathan -- the complete man! The key is that he -- and she -- have given their lives totally to Jesus and are willing to follow Him in obedience, even radical obedience. Through the years Becky and I have watched in amazement as the Lord shaped Nathan into a man who uses all of his talents for the Lord -- a man who possesses godly desires, godly goals, godly thoughts, godly aspirations, and, perhaps most important of all, a loving heart. He is being changed into the image of Christ, and the change is still going on, the only difference is that now he will share that process with the one he adores and who adores him. I simply bow my heart in humbleness and gratitude before the God of the universe! On Saturday afternoon we left Franklin to drive to Fayetteville for a series of meetings at Trinity Baptist Church, where Josh Owen, a former student of mine, and his wife Renae have faithfully served the Lord for the past two years. Josh has a huge shepherd's heart and tenderly loves his flock, a fact that was obvious to me after spending two days with him. A man tends to become what he reads, listens to, and dwells on. Josh has a scholar's passion for Scripture. He is deeply rooted in it. He also asked me several challenging questions. As he put it, once my student, always my student. How very true! My weekend with brother Josh and the people at Trinity was marvelously memorable. I gave a total of 3 messages, from Luke 2, Luke 3, and Matthew 1. Throughout my talks I heard the sweetest sound one can hear in a church -- the rustling of Bible pages as people turned from Scripture to Scripture. A nice serendipity was meeting up with an old friend from Winston-Salem, Edwin Sineath, who drove down for Saturday night's session. Edwin and I usually see each other during my battle reenactments, when I am dressed in slightly different array. Honestly speaking, though, for me the highlight of our visit to Trinity was hearing Nathan play the church organ. Most people don't know what a tremendously difficult instrument the organ is to play, and to play it as well as Nate does. As he chorded the great hymns of the faith during the prelude and postlude and as he accompanied the piano during the congregational singing, I heard nothing but whispers of delight from the congregation. It was truly a blessing for me as well. Thank you, Nate! I'm glad Nathan decided to come with me on this trip to Fayetteville. As he put it to me when I invited him, "Sure, Dad. You know, there won't be too many more times when we can do things like this together." He's right. Nate and I have had a wonderful life together. He has accepted my weaknesses, forgiven my faults, and acted on the promises of God in his own life with unfailing constancy. It is now a great joy for me to see Nathan give his loyalty to Miss Jessica, the lovely woman who I hope in years to come will be bestowed with so much honor from her husband and her children that it will cover her from head to toe. 5:48 AM Off to visit Jessica and family. Warning: I'm taking the camera! 7:47 PM Nathan here. Can you guess what we've been doing lately? Dad took these pictures and asked me to tell you a little about them. The back part of my house was originally a large room, or "parlor," and a "hall," which contained the staircase. It was definitely built before 1830 because it was made using very large hand-hewn beams, and sawmills were set up in this area in 1830. It is probably older than that, but due to remodeling over the years there's no original flooring, molding, doors, or siding by which to help date it, only the frame. We have dated several outbuildings to the 1780-1790s, so it's possible the house is that old as well. Anyway, about 1850 they build the "front" part of the house, which is a typical antebellum two-story center-hall house. About 1900, judging by the narrow 3" board walls and 3" flooring, they took off the roof of the original back part, which had a "half story" attic as a sleeping space, and created a full two stories, matching the 1850 front house. At that time they also removed the original stairs and interior finish of the old part and recovered the walls, ceiling, and floors with the 3" boards which were in style at that time. Then when electricity was brought into this area in 1955, the previous owners put up a partition dividing the original large parlor into a kitchen and dining room, replacing the separate kitchen building that was standard on farms before electricity removed the fire danger from wood cooking. Finally, they covered all the 1900s board walls and ceiling with sheetrock. We are removing the 1955 partition to open up the original large room, which will become Jessica's new large kitchen and will be about 15 feet by 24 feet. Today we stripped the sheetrock off of what is now the dining room. This picture shows the partition added in 1955 to make two rooms (dining and kitchen) out of one large room. The 2 studs at right are level, the original house walls have racked and are now about 4 inches out of level from top to bottom. You can see the 3" boards that were put up about 1900 when they added the upstairs rooms. Here is the window looking out to the back porch which is now enclosed. There was a set of built-in cabinets on this wall. Behind this sheetrock was a little termite damage, which I expected in this spot due to how low it sits on the ground and the concrete porch which was added directly against the wood frame of the house in the 1950s. It was nowhere near as bad as I expected though. Jessica and I have decided to remove the boards on the ceiling to show the old hewn beams, but leave the wall boards (yes, I know, the ceiling and walls are crooked, but in an old house what isn't!). Can you believe someone would cover those beautiful boards with sheetrock?! As they say, men never grow up, their toys just get bigger. A lot bigger! When I was little I loved to build ponds and hills in the sandbox out in our yard. Now I can do the same on a much larger scale! This track loader is a very valuable addition to our farm equipment, as I will use it to enlarge fields, dig stumps, build ponds and farm roads, and clear brushy areas for productive hay land. It is an "International 250" and was made in 1978. It weighs 53,000 lbs and has about 180 horsepower (compared to the average farm tractor of about 30-50 hp). Still runs good for its age, just needs new batteries! It has a few minor fluid leaks, but that's typical for an old machine. Beavers, watch out--here I come! 5:46 PM It's official: The pond is full again! This calls for a celebration. Let's see, what shall we eat? Hmm, I think I'll make ---- Chinese food! 1:29 PM Just received an update from Traveler's new owners. That really was nice of them to send it to me. I was happy to hear that he feels settled on his new farm. I've resigned myself rather heroically to the situation. I don't know which I enjoyed more -- riding big waves or riding fast horses. Where has the time gone? Wasn't it just yesterday that I was driving to the North Shore or to Huntington Beach, or taking Cody and Traveler out for rides in the countryside? They were so funny. If I took one horse out I had to saddle up the other one as soon as I got back or he'd feel left out. 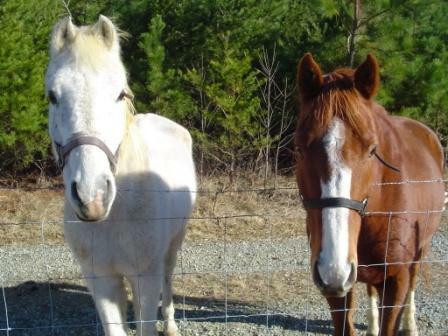 Them horses sure brought me a lot of joy, and I still miss them terribly. Spose I always will. 12:16 PM The costs of war. 11:31 AM I fly economy on my trips abroad. You know, the sardine seats. 14 hour flights, too. And I'm 6' 4". Yet on both legs of my recent trip the Lord Jesus gave me the chief seats in the synagogue -- so much leg room that I literally could not touch the seat in front of me and had to unbuckle my seat belt in order to reach the magazine pouch. Ain't He somethin'? Was it selfish of me to have prayed before my trip that He would provide those seats for me? What a serendipitous God we serve! 10:44 AM I just spoke with the most überwonderfullest woman in the whole wide universe. She sounded great and rested. Baby Nathan is doing fantastic: eating every two hours, putting on weight. The stool sample checked out good, so there is a slight chance that Aberesh and Nathan will be released from the hospital tomorrow, with Becky continuing to monitor their condition. I also spoke with one of our sons, David (photo), who is visiting Mama B from Alaba. I asked him how Becky's Amharic is doing and he reported that she speaks it fluently. Becky disagreed, but I think she's just being self-effacing. Want to hear something funny? Becky says that when she's talking with Aberesh she catches herself speaking German instead of Amharic. I can identify! It's hard to keep one's languages from merging. I recall that many times in Switzerland Becky would think she was speaking German when she was really waxing elephant in Spanish! I would have to politely interrupt the conversation and whisper, "Liebchen, Deutsch bitte." I suppose this is as good a time as any to say a big THANK YOU to all of our extended Ethiopian family who have taken such good care of Mama B while she has been in Ethiopia: Bereket, Mengisteab, Nigussie, David, Mercy, Emebet, and Burje Guba. If I have failed to mention your name please forgive me. I deeply appreciate your watch-care over my beloved wife as you have helped and protected her in my absence. You will never know what that means to me. 9:54 AM The rain is falling, a nice slow drizzle. It will guarantee at least one good cutting come May. The Lord is so gracious to us. Right now Nate is pulling up the flooring in his kitchen. He's sold it to a man in Raleigh who is remodeling his house and needed old 3-inch flooring. This is all part of the major job Nate is doing to redesign his kitchen and dining room. Jessica has already seen the house so it's neat to watch Nathan thinking, "What would Jessica want here?" As replacement flooring he is using some lumber we salvaged from an old house. I can't remember where we got it, but we have been storing it for a rainy day like today (and for when Nathan found him a wife). Later I'll go to his house to help him remove bricks from the old chimney. My job is the "dump master." Somebody's gotta do the skilled labor! Precious, aren't they? No better friends, that's for sure. Except for one's wife. I get to call Becky in a few minutes. Can't wait! 8:04 AM I am working on a kind of position paper on missions now ("Missions and the Local Church: Refocusing Theological Education") and hope, when that is done, to get down to an essay on the subject of dogmatic ecclesiology -- at once theological and practical, speculative and devotional. Genuine Christianity as such will, I am quite sure, become a minority religion as we move toward a more technological and militaristically unified world. It has become associated, in the eyes of too many people, with the beastlinesses of our political and economic imperialism. Otherwise no news here. I think I nipped my head cold in the bud -- for which I am very thankful to the Lord as tomorrow we are planning on driving over to Jessica's farm and after that I must speak on Saturday night and Sunday morning in Fayetteville. Today the work will continue on Nathan's chimney project. I have not yet heard from Becky today but pray that the news will be good when I do. Nate will soon be up here from his farm house for coffee. For this reason we have not stopped praying for you since the day we heard about you. We ask God to fill you with the knowledge of His will through every kind of spiritual wisdom and insight. We ask this so that you will live the kind of lives that prove you belong to the Lord. Then you will want to please Him in every way as you grow in producing every kind of good work by this knowledge about God. We ask Him to strengthen you by His glorious might with all the power you need to patiently endure everything with joy.You will also thank the Father, who has made you able to share the light, which is what God's people inherit (Col. 1:9-12). 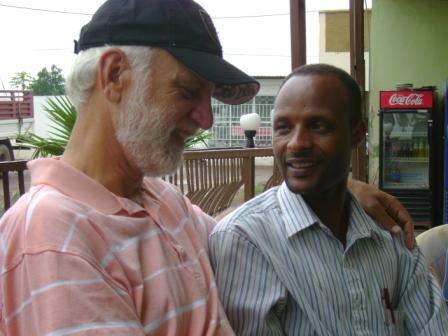 I talked recently with Tilahun in Gondar; he is the facilitator of our evangelists. D & E, because of severe persecution (imprisonment, stoning, eviction and inability to find merchants willing to sell them food) for the past 3 months, have taken a time of rest in Gondar, and are now repositioned in another village. This new village is on the road toward Sudan. Please pray for them to remain strong & willing to suffer for our Lord. And pray for His grace and provision as they begin a new ministry in this new village. They are planning to remain in this new village for a period of time, to allow the hostility in the previous village to die down; then they plan to return to the first village & continue the work. Also pray for the new believers in the first village. They need discipleship. In the short time (about 3-4 months) that D&E were able to operate in the village, many came to Christ; even while they were imprisoned, they led 5 to the Savior!! Of course, now these new believers are also facing persecution (shunning, beating, etc.) by the Orthodox. As you pray for D&E, please also remember these new believers who are the spiritual children of D&E. The other 4 evangelists remain in their villages, strong in their witness for the Saviour. In case you have forgotten, one of these evangelists became a "marked man" by all the Orthodox leaders, so we had to replace him with another evangelist; we did this for the sake of his life. Please continue to be faithful in praying for these men. In my opinion, I am not worthy to stand beside them, because they are suffering so much for our Lord while I have it so "easy". Let us be strong to do our part in the Kingdom!! Those of you on our email listing received our urgent prayer request about the Orthodox burning the church on the road from Gondar to Eritrea. The hatred of the evangelicals, inspired by fanatical Orthodox priests, led a mob to burn (with the use of gasoline) a small chapel; they also burned the home of an elder of the church, and they started to stone the Christians. 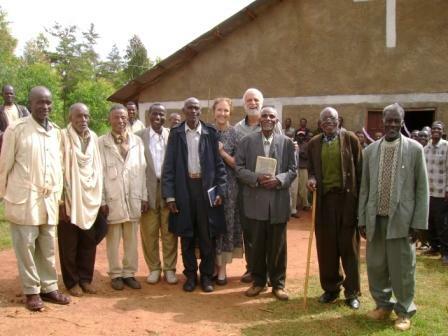 This congregation consists of about 20-30 believers; they were all gathered together. When they realized that the burning was extending to their stoning, they ran to the police station and surrendered themselves to the government for protection. They remained in prison for their protection until the furor subsided. Currently these Christians are now out of prison, and the government has imprisoned the perpetrators of these crimes on charges of arson. The congregation owns the land upon which the chapel stood. We are hoping that the government will not only imprison those guilty, but will also require them to pay restitution so that the chapel can be rebuilt. I told Tilahun that the new chapel must be made LARGER than the old one, and must be built of concrete walls & tin roof! We have seen in many places in Ethiopia where Orthodox and Muslims have burned evangelical churches, but in the end our Lord's church is made stronger and her light shone more brightly. We are trusting Him to do likewise in this little congregation in Gondar....for His own glory!! We want to remind everyone that we cannot post too many details on the website because of the delicate situations in which we are involved. If you would like to be on our email update list, please email us with your address. 6:35 PM I think you'll enjoy this essay about burnout among pastors. The whole question of the “pastorate” is rather troublesome. There is – apart from the sheer grief of overwork – an added pain in the cynicism of the situation. One ought to be grateful and thankful for all the years that pastors spend in church work, ministering alone at times. Solitary pastorates are perhaps the ne plus ultra of human wisdom. But God, I think, has a better plan. Such is the point of Alan Knox’s recent blog entry. I can think of several pastors who could profit from reading it. 1:46 PM Here are some pix for Mama B to enjoy in "Ethiopa" (as Caleb calls it). Nathan recently repainted all of the farm signs. In the background is his and Jessica's farm house. Do you think he may have suspected that we would shortly be having hundreds of visitors? At any rate, it shore looks nice. Ya better get off that pile before Master Nathan sees you, Miss Chicken. He don't like no one messin' with his m'nure. One more chimney needs to be rebuilt before Jessica moves into her new home. The work has just begun. We have exactly one month from today to complete it. What do you think: Can the bearded ones do it in time? Everyone misses Mama B, even the animals. Just think, in a month there will be two ladies pampering these cutie pies. Here's Sheba enjoying a swim in the creek. Her husband Sheppie was too chicken to get in the water. Maybe he doesn't know how to "dog paddle" (hehe)? The violent storm on Tuesday night not only filled the creek but took down this fencing. Nathan found the 16-foot iron gate, bent and tangled up, 200 yards downriver. Another thing to do before the big day. Hope you enjoyed these reminders of home, honey. I love you! has given His church such a warm-hearted and capable scholar. Meanwhile, my love to all who have written notes of encouragement to Becky Lynn, who on occasion is able to check our emails in Addis. I believe and rather hope that mother and baby will be back home in two weeks' time, but it is all in God's hands. If all goes well, I expect to see Becky again on the 26th, and until then I shall miss her constantly with the whole gamut of thoughts and feelings associated with it. I am very touched by the good work God is doing through her, but I must be careful to give credit where credit is due. I am asking the Lord to give me a humble attitude and never permit me to rob Him of the glory that is due to His name alone. 10:24 AM Forget the hats. I say grow a beard. covered in ivy and moss so green. her eyes forlorn with sad sheen. "Dear Lord, where is my knight? Wilt thou not send him today? I am so tired of waiting. The misery just grows stronger. This is above and beyond my strength. I can wait no longer." In search of her man. Arrived her knight with armor that shone. Then called her on her cell phone. A full voicemail was all he got. That his "maiden in waiting"---was not. How often are you tempted to disregard what the LORD has done and is doing and WORRY about whether or not, when and where, how and why, who and what....about Mr. Knight N. Shining Armor? If your truly a maiden in waiting that depends and trusts the Lord, then stop letting the devil take hold. I speak from experience, dear sisters. Do you trust the Lord Jesus for your salvation? Your daily needs? Your next breath? Then why not in the area of marriage? IF He has a knight in shining armor for you, then don't you think He will send Him when HE knows your ready (and your knight is too)? Maybe the Lord doesn't even have a knight for you and I. That is a possibility too. If we can't be just content to trust and rest in Jesus, who is King of Kings and Lord of Lords... what makes us think we will be content in a fleshly, mortal man? Just some thoughts, dear single sisters, that I challenge myself with of late. Note: The above poem makes me laugh. I think it's the most funniest one I have wrote in a long time. I started out really serious, really thoughtful and with a good lesson and a good ol' dose of cod liver oil...but I couldn't resist to add in the funny things that came to mind. If I could only draw the above like I see it in my mind! I LOVE the Lord Jesus Christ with all my heart and soul! I have a heavy burden for others that do not know the Lord as I use to be one who knew Him not. All I share on this blog is from experience in one way or another. Ten years ago this spring (2008), I asked the Lord to reign in my life. Before that I was your typical christian. What is a typical christian? One who cares more for themselves then obeying God's word. One who prays when its convienent, for example, when they want something. Sounds like a spoiled rotten brat doesn't it? No repentance, just keep sinning over and over again, asking for forgiveness but not changing. I love the family that God has given me very much. I have 4 brothers and 5 sisters (in laws included), lots of nieces, nephews and great nieces and nephews! Our sons are like their daddy, witty, strong, good thinkers, and all around jokesters. Just today as I was driving out the lane, Justin pops out of a bush, I hit the brakes to slow more and scream inside the truck! He laughs all the way to the porch! I laugh too, while going on down the drive. There is never a dull moment with my boys around! I have made my family my career, there is no better career in all the world to be had! Michelle is right: God is faithful to those who trust Him and (in the power of the Holy Spirit) obey Him. Becky and I have, I think, begun to taste the blessing of obedience in our own lives. And what blessed relationships He has granted us! Praise the Lord, He has truly been gracious to us in giving us not only Jessica but also her family. In Ethiopia it is now Thursday morning, 11:30am. First I want to say THANK YOU to everyone for praying for Baby Nathan, Aberesh & me!!! Our Lord has been acting on our behalf in so many ways! Like the water He brought forth from a rock for the Hebrew people as they journeyed thru the wilderness, so He has brought forth Vitamin K from a little pharmacy here in Addis. We now have enough Vitamin K for Baby Nathan, and also for the whole hospital for a little while at least!!! This little pharmacy has located 15 (FIFTEEN!!!) vials of this precious fluid!! It truly is the Lord's provision. So Baby Nathan was able to get a therapeutic dose of the vitamin, and now all evidence of bleeding has stopped. (The laboratory has botched 3 blood samples, so we have no authoritative documentation of normal coagulation, but since we now have beautiful clear urine, we are considering this problem as cured.) Thank you for praying, and sending us advice. This has been a wild ride! Dealing with acute illness of a newborn, in a 3rd world hospital, with shortage of basic medicine and incompetent technicians...but our Lord has given us a good doctor & nurses, and He has provided for us in the midst of these challenges. Both Aberesh & I are very tired; we are living at the hospital, sharing a bed in the Labor Ward, across the hall from the Neonatal Intensive Care Unit. Daily I walk to a restaurant to get food for us. We shower every 3-4 days, using the Surgery Unit's shower, and our own towel/soap. We are thankful for this hospital and the Lord's obvious blessings to us. Please continue to pray for Baby Nathan, Aberesh & me, and for wisdom as we make decisions about continuing to treat a case of meningitis that we cannot prove. Aberesh & her family are overwhelmed at the outpouring of love and prayer support from Christian brothers & sisters they have never met. 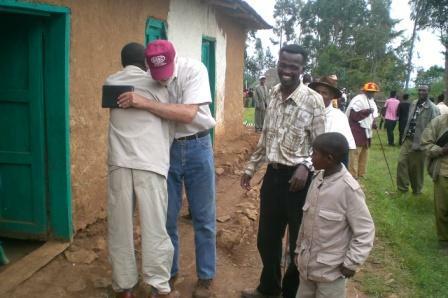 And it seems the whole of Ethiopia is noticing how the Body of Christ works, with its outpouring of love! Everywhere we turn, people comment on their amazement at what is happening. May our Lord bless you abundantly for your care for these precious ones, and may His Name be lifted high as the Author of Love!!! In America we praise rugged individualism and self-initiative. The fact is that most of us function more smoothly and effectively as part of a team rather than as individuals. This has certainly been the case with Aberesh and her baby. Everybody is getting into the act, everybody is being blessed, and the Lord Jesus is getting glory while His church is being edified. Lots of reasons to praise Him this fine morning! Below: Building a book shelf for the Bible school in Burji, Ethiopia, June 2006. Teamwork in action. 7:20 AM The latest addition to our home page is called An American Theocracy? 8:30 PM Tonight Nathan taught us from 1 Corinthians 6 about responsible stewardship of our physical bodies. I confess that I love the way he teaches and the simple lessons he draws. I've been teaching teachers for 31 years but even I still pant with excitement when I see and hear sound biblical teaching on a deep yet practical level. Nathan's probing questions (of the text and of us) help to crystallize the insights of the Bible. How can a man so young and so "unlearned" be such an effective communicator? Where does he get this facility for translating difficult texts into simple truths without being at all simplistic? He may have gotten his balding scalp from his dear old dad but not his pedagogical abilities. The key, I think, is that Nathan has been "under the Word," as we used to say in Switzerland (unter dem Wort). Why travel a hundred miles to take a course when you can just walk across your living room, pick up your Bible, and get into it yourself? I think of the high priest's dismissal of Peter and John with the scornful charge that they were "uneducated and ordinary men" (Acts 4:13). Actually, Peter and John did quite well as teachers, thank you very much, without the formal training thought so essential for an educator in that day. The difference with those two apostles was that "they had been with Jesus." What about you? Me? Does our life tell others that we have been in the presence of the Master Teacher, that we walk with Him intimately? Frankly, I'll take a self-taught, "uneducated and ordinary man" over an edu-macated fool any day. 6:23 PM My thanks to Liz for keeping everyone updated so well on Mama B’s doings in Africa while I was away. I spoke with Becky again today. 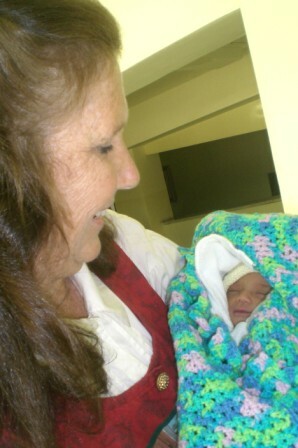 Here's the latest on Baby Nathan, who is now in the neonatal intensive care unit in Addis. Two days ago he started to bleed, the cause of which was a vitamin K deficiency (which is normal with preemies). Nobody had any vitamin K anywhere, not even in the hospital, but one of our Ethiopian sons miraculously found some, and Nathan's bleeding has stopped. Praise the Lord! However, the baby is now fighting an infection in his intestines. The danger is that the infection will spread to his brain. The doctors did two spinal punctures but the lab messed them up, so there were no results. Tonight they will try one more time. If the results are negative, the doctors will rule out meningitis and treat the baby for a simple infection. Aberesh and Becky can leave the hospital with Nathan, and in a week or so Becky can take them home to Dila while she presses on to Burji for her meetings. If the test is positive, or if the lab messes things up again, the doctors will keep Aberesh and the baby in the hospital for at least two more weeks, under the assumption that they are treating him for meningitis. Right now Becky and Aberesh are sharing a single bed in very cramped quarters in the hospital, and Aberesh is feeding the baby every two hours. Becky has two specific and urgent requests: (1) Pray that the spinal test is successful, and (2) pray that the result is negative. Our God is able! Becky is tired but coping. 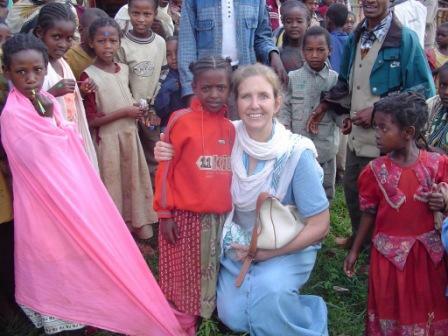 She has been in Ethiopia for over 8 weeks now. But she is prepared to stay with Aberesh and see that Nathan is treated aggressively. Becky has postponed her arrival back in the states until March 26. It is unlikely that she can postpone it again in view of the wedding preparations. Let us thank God for His provision of the vitamins. Let us trust Him that the test tonight will go well with the desired results. And let us be fervent in our intercession for our dear precious sister who is standing strong for Aberesh and her son (Gal. 6:2). I thank God for every one of you. It is a privilege and blessing to know that you are standing with us. 3:33 PM Just returned from taking the dogs for a long walk on the farm. Actually, I took myself for a walk and the dogs were the excuse. I do love this place. I often think, What was it like for its residents when they sent their sons off to war in 1861 or during the Great Depression? I shall never know. I do know that the significance of the farm lies in the future and not in the past. Every fence post, every building we put up, is a reminder to me that this is God's farm. Let Him, then, be pleased with it! Please do keep Becky in your prayers. The baby is here, but Becky's work has not ended. It is only being refocused. She is staying in the hospital with Aberesh under difficult living conditions (do not think of a Duke or a UNC). After that she must take Aberesh and baby Nathan back to their home in Dila, and then Becky must press on to Burji for important meetings about the health clinic we hope to reopen this fall. Being a faranji (foreigner) means people can be demanding on your time. Being Becky (gregarious and tender-hearted) means you delight in meeting others' needs. The work can be exhausting. I tried to call Becky several times today but there was no answer on her mobile, which makes me think she is much occupied with the needs of others. So let's continue to be Aaron and Hur on her right and left, shall we? I appreciate it so much! I'm still answering emails. If you do not hear from me today you can plan on an email tomorrow. 10:53 AM I returned to Bradford Hall at 12:30 this morning. I have the most wonderful news, on two fronts. First, Aberesh has had her baby. On Wednesday her blood pressure went up to 170/110 so they decided to perform a C-section. The baby weighed 3 pounds, 14 ounces. Becky reports that he is healthy and nursing well, and that Aberesh is healing up fine. 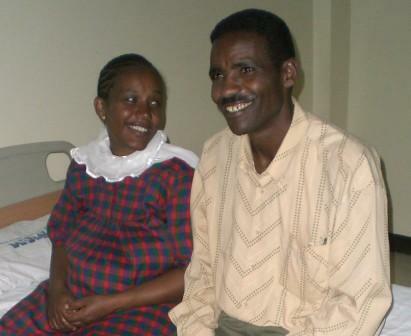 Both Aberesh and her husband Tilahun thank everyone for praying. Secondly, for many years Becky and I have devoted ourselves to prayer that God would provide a wife for Nathan. Though we are very limited in our perspective, we have always felt we could draw on the inexhaustible treasures of God. And He has provided! Nathan greeted me last night with the wonderful news of his engagement to Miss Jessica Terry of Franklin, Virginia. Nathan and Jessica have decided on a simple wedding here at the farm in April. We'll provide the details later, but Becky and I could not be more excited. My teaching last week was abundantly blessed. I cannot tell you where I was but I can say that all I did was go through the book of Philippians verse by verse, in the Greek text, with 30 house church leaders who could read Greek but hardly a word of English. Their happiness was intense and their misery (yes, there were assignments) equally real. On the last day of class I told them to expect a special treat. I read out loud, from beginning to end, the entire book of Philippians in the Greek exactly as I imagine Epaphroditus would have done to the flock of believers that had gathered in Lydia's home 2,000 years ago. (In my mind's eye I could see Euodia sitting over here, Syntyche reclining over there, and Suzugos between them. The jailer and his family were present also -- or so it seemed as I looked out at my students.) It was moving. This was the first time I've done this in 31 years of teaching. I don't know why I didn't think of this before (somebody get out the stupid stick). As for the events of the world, I know nothing and am enjoying my ignorance tremendously. I am inundated with emails, which I hope to answer today. Tonight I am speaking at a missions conference in Youngsville, NC, then it's back to school. This has been a time of great blessing. Nathan has found His bride, the fruit of the prayers of 25 years. She is absolutely perfect for him. 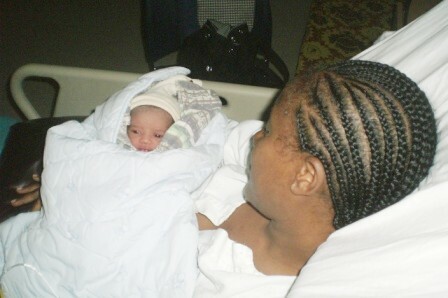 God has blessed Aberesh and her son beyond our expectations. My work abroad was deeply satisfying. By the grace of God we have the assurance that in all these things God is working for good and that He will continue to direct our paths. He has once again given us precious proof that He is delighted when we expect great things from Him. My joy in God cannot be described. God blesses His people not so that we may gratify ourselves but for the sake of using all that we have in His service and to His glory. We should serve cheerfully and not because it's required. It has been a great blessing to me to watch Becky be a channel though whom God's blessings flow. As she has cheerfully yielded herself to His purposes, the channel of blessing has become wider and deeper. I stand in awe before my Lord and Master at the river of His bounty. We have abundant reason to praise God for His goodness and to go forward in the strength of the Lord. One last note. Many have been praying for a wife for Nathan, but no one more than Aberesh. She and her husband have decided to name their son "Nathan" in thankfulness to the Lord whom they serve.